Tonight at 7:15, the New Jersey Knockouts begin their season in the United States Chess League when they square off against the Carolina Cobras. 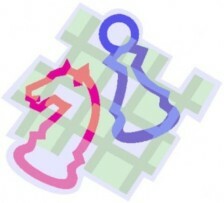 Follow the action on the Internet Chess Club. There has been a schedule change for the after school chess program through Enrich and Grow Academy. On Friday afternoons, I will be teaching at Center Grove School in Randolph, not at Saint Elizabeth Ann Seton Academy in Wayne as previously reported. Classes begin the week of September 26th. 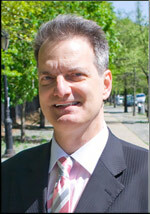 The Marshall Chess Foundation proudly presents international grandmaster Ron Henley. 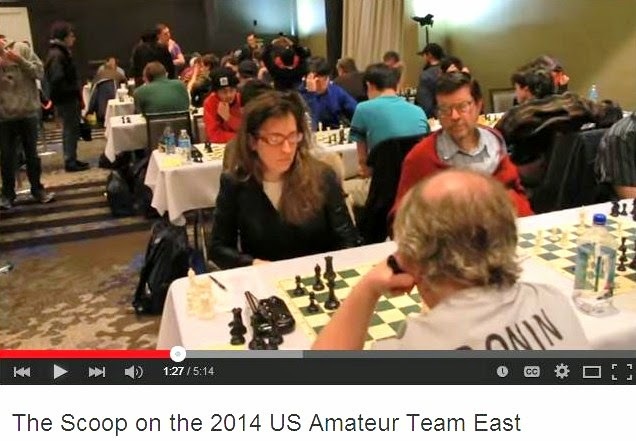 Grandmaster Ron Henley is one of the country’s most distinguished tournament players, authors, and coaches. As the longtime head coach of the twelfth world champion Anatoly Karpov, Henley has gained rare insights into the thoughts and decision making processes of chess at the very highest level. In this lecture, GM Henley will focus on the Dzindzi Indian Defense, an opening that he plays on a regular basis with Black. In between an earthquake and a hurricane, I celebrated a milestone birthday. 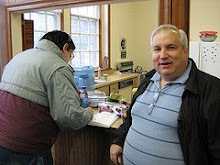 Due to Hurricane Irene, the Marshall Chess Club will be closed this weekend. Sunday's quads in Westfield have also been canceled. CANCELED DUE TO THE HURRICANE: 3 RR, G/45. Westfield Y, 220 Clark St., Westfield, NJ 07090. Prizes: $50 to first in each section. EF: $20, $15 Members. Reg. : 1:30-2:15 p.m. Rds. 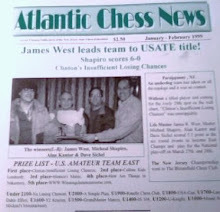 : 2:30-4:20-6:10 p.m. Info: Todd Lunna 732-526-7163, lunnaco@aol.com, www.westfieldchessclub.com. In August 1923, the Ninth American Chess Chess Congress took place in Lake Hopatcong NJ. Hellner - West @ "Contre Gambit Philidor"
Frederic Fournier gives a link, at Contre Gambit Philidor, to my game as Black against Wesley Hellner. 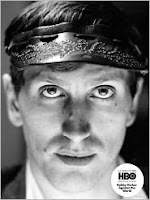 Review of Benson's Book "Bobby Fischer"
Leonard Cassuto reviews photographer Harry Benson's book Bobby Fischer. 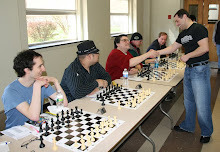 The FIDE Mondays tournament ended last night at the Marshall Chess Club. I finished with a score of 2-0-4. 31.f6 Qd8 32.fxg7+ Kxg7 33.Rd3 Qh4 34.Rf3 Kh8 35.Rxf7 Rxf7 36.Bxf7 Qf2, draw. 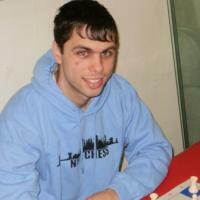 International master Vladimir Romanenko [pictured] won the Manhattan Open at the New Yorker Hotel on tiebreak over grandmaster Alexander Shabalov. 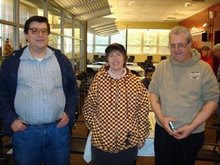 In today's game/30 Swiss tournament at the Marshall Chess Club, I finished with a score of 2-1-2. 34.Be3 Bxe3 35.fxe3 h4 36.Nh1 Qf1+ 37.Kh2 Rf8 38.Rb1 Qf5 39.R4b2 Bd3 40.Re1 Qg5 41.Nf2 Rxa4 42.Ng4 Raa8 43.Rb7 Rf7 44.Qb4 Raf8 45.Rb8 Rxb8 46.Qxb8, draw. 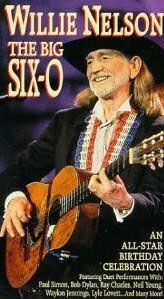 Today I won this game at the Hamilton quads. 70.Kc4 Nc5 71.Kb4 Nd3+ 72.Kc4 Ne5+ 73.Kb4 b5 74.Rh8 Nd7 75.Rh5 Nc5 76.Rh8 Kb6 77.Kc3 Na6 78.Kd4 c6 79.Rh7 d5 80.Rh8 b4 81.Ra8 c5+, White resigns. 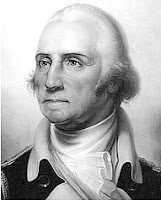 In his "Double Rooks" column, Carl Jacobs writes a brief history of American presidents and their fondness for chess, in parts one and two. 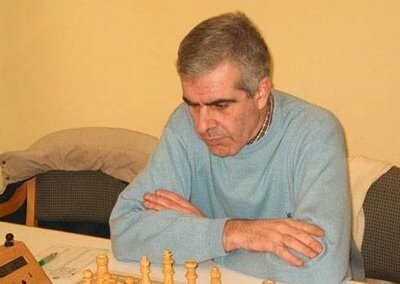 Alejandro Melchor [pictured] of Barcelona writes "Black has a ruinous position" in the Newark gambit after 5.Bb3 fxe4 6.Nxe5 dxe5 7.Qh5+ Kd7 8.dxe5 c6 9.O-O. Perhaps Black can play 8...Kc6 9.Qe2 Bc5 10.Nc3 Kb7 11.Nxe4 Bb6. Brenner - West @ "Contre Gambit Philidor"
Besides providing a link to my game as Black against Stav Brenner, Frederic Fournier also mentions Alejandro Melchor's suggested move 5.Bb3 against Lev Zilbermintz's line in the PCG. This game ended in a draw last night at the Marshall Chess Club. 12.Ba6 Nb8 13.Bxb7+ Kxb7 14.Rhe1 a6 15.Kb1 Rde8 16.d5 exd5 17.Rxd5 Qf7 18.Qd3 Qg6 19.g3 Re6 20.Nfg5 Bxg5 21.Rxg5 Qxg5 22.Nxg5 Rxe1+ 23.Kc2 Re7, draw. This fall, I will be teaching after school chess classes through Enrich and Grow Academy, as follows: Mondays at Shongum Elementary School in Randolph, Tuesdays at Saint Elizabeth Montessori School in Parsippany, and Fridays at Saint Elizabeth Ann Seton Academy in Wayne. Playing in the two day schedule, I finished with a score of 2-0-2 in the under 2300 tournament at the Marshall Chess Club. 32.b3 Qc6 33.Kb2 Ne4 34.c4 Nxg3 35.hxg3 Qd7 36.Qf8 Qd4+ 37.Kc2 Qf2+ 38.Kb1 Qxg3 39.Ka2 Qf2+ 40.Kb1 Qb6 41.Kc2 Qc6 42.Kc3 Kd7 43.Qf7+ Be7 44.b4 Qf3+ 45.Kb2 Qe2+ 46.Kb3 Qd3+ 47.Ka4 Qxc4 48.Ka5 Qxb4+ 49.Ka6 Kc7 50.Qxe6 Qa4#. 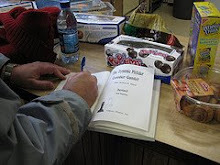 This game was played earlier today, at the Marshall Chess Club. 14.g3 Qg8 15.Bxf6+ Bxf6 16.Qxg8+ Kxg8 17.Bg2 Bg5+ 18.Kb1 Nf6 19.h4 Bh6 20.Rde1 Bg4 21.Bxe4, draw. Besides being a tournament director and chess coach, Dan Herman [pictured] also writes and performs rap music. On Tuesday night, August 16th, Dan will be performing hip hop music, under his professional name Phi Beta Rapa, at Coffee Works in Voorhees. 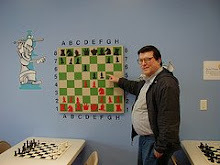 At the Dean of Chess Academy, I won this game last night in the Wednesday chess league. 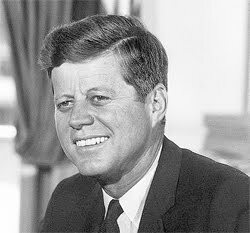 39.Kb2 Ke8 40.Kb3 Rh7 41.Rgd4 Rg7 42.c6 Rh7 43.cxb7 Rxb7 44.Rc1 Rb8 45.Rdc4 Rd8 46.Rc8 Bh6 47.Rxd8+, Black resigns. 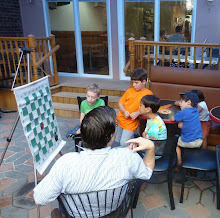 Starting on September 7th, I will be teaching after school chess classes on Wednesday and Thursday afternoons at The Ethical Community Charter School [TECCS] in Jersey City, as an employee of 101 Discoveries founded by Natasha Kalenchits. 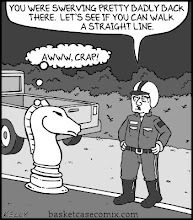 In last night's game at the Marshall Chess Club, I managed to draw an inferior ending. 38.Kg2 Rc1 39.Kf3 Ke5 40.Rc7 c2 41.Ke2 Kd6 42.Rc3 Ke6 43.Kd2 Rf1 44.Kxc2 Rxf2+ 45.Kd1 Kf5 46.Ke1 Rh2 47.Rg3 Kf4 48.Rg4+ Kf3 49.Rh4 Ke3 50.Kd1 Kf3 51.Rxh7 Kf4 52.Rxf7+ Kxg5 53.Rh7, and drawn in ? moves. Sergey Kudrin has been a dominant force on the U.S. chess scene for decades. 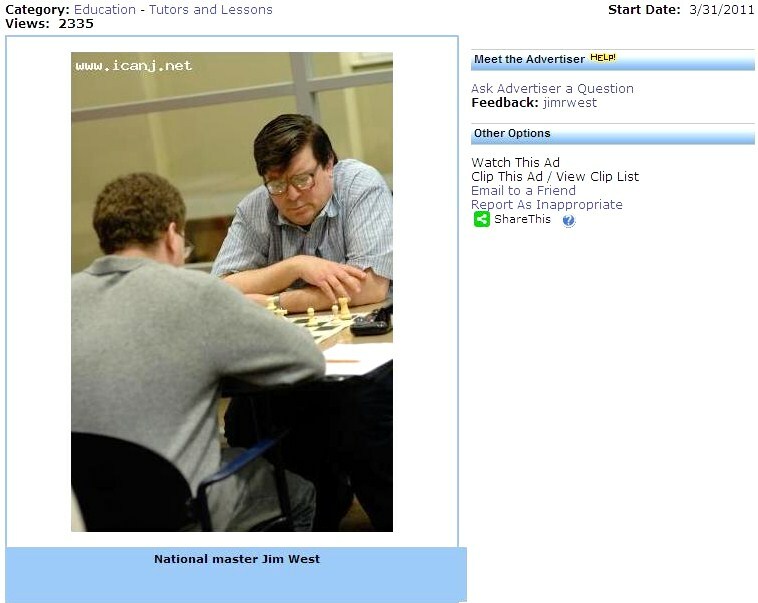 Kudrin is a three time U.S. Open champion, a three time world championship contestant, and (together with GM Mark Paragua) the reigning Marshall Chess Club champion. 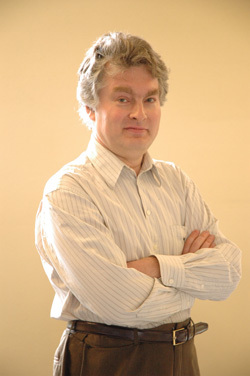 He is also one of the country’s most respected chess coaches. 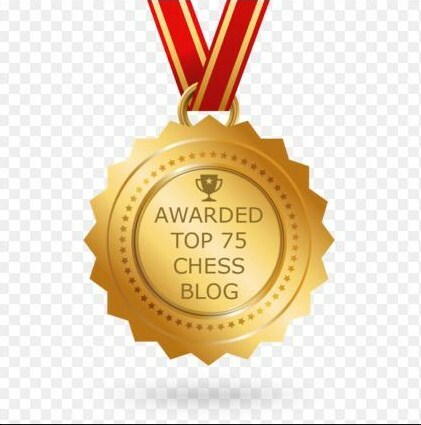 In his lecture, GM Kudrin will present and analyze some of the most interesting and instructive games of the current world championship cycle, as well as share personal insights on the unique challenges of the competition. 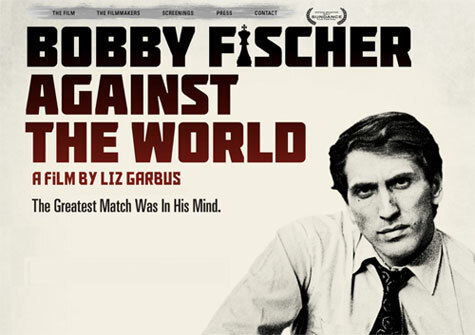 Here are reviews of Bobby Fischer Against the World from Phil on Film and Cine Vue. These games were played earlier today at the Marshall Chess Club. 17.b4 f6 18.bxc5 Bxc5 19.Bxc5 bxc5 20.Rdb1+ Kc7 21.Rxa6 Rb8 22.Ra7+ Kc6 23.Rba1 Nf4 24.Kh2 Ne2 25.R1a6+ Kb5 26.Ra5+ Kb4 27.Ra3 Kb5 28.c3 Nxc3 29.Rxc3 g5 30.Rb3+ Kc6 31.Rxb8 Rxb8 32.Ra6+ Kb5 33.Rxf6 Rd8 34.Nxe5 c4 35.dxc4+ Kc5 36.Rf5 Rd2 37.Kg2 g4 38.fxg4 hxg4 39.Nf3+, Black resigns. 28.Bf3 Rf1 29.Bg2 Rf2 30.Kg3 Rc2 31.Bd5 h5 32.Bb3 h4+ 33.Kxh4 Rg2, White resigns. 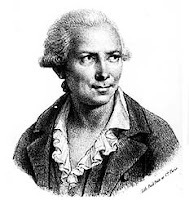 Lev Strikes Again @ "Contre Gambit Philidor"